Valbona Ajeti proudly displaying her products. December 2017 — Valbona Ajeti is one of the most enthusiastic, strong-willed, and determined people you will ever meet. She lives with her family in Sllatine e Eperme—a village in the Kosovo municipality of Viti. 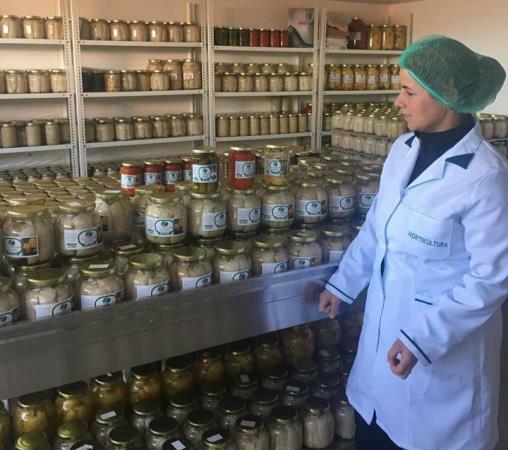 Her company GRASEP — an acronym that translates to “women of Sllatina e Epërme”—has 20 women employees and produces preserved vegetables and pickles, but its main product is Ajvar, a famous sauce made from red peppers that goes with virtually everything. “When I first started, people thought we are just a bunch of women wasting time. No one took us seriously, mainly, well, because no women run a business where I live,” says Ajeti, laughing. Ajeti, together with other women and men from Viti, attended continuous training in 2016 on women’s rights, with a focus on property and inheritance rights, business, and other managerial skills organized by the local NGO Kosova Women 4 Women (KW4W). The training was part of USAID’s Engagement for Equity program that helps civil society to develop policies supporting vulnerable and marginalized groups in Kosovo. The country has good laws on the books that guarantee a woman’s equal right to property, but implementation of such laws is very slow, mainly because of the traditional attitude of Kosovar society. In the Balkans, and specifically in Kosovo, only male members of the family inherit property, with daughters left out of the will. Although laws ensure an equal share among heirs when there is no will, strong social pressure coerces daughters to withdraw from inheritance leaving brothers as the only benefactors. The same pressure is placed on men who register property jointly with their wives. After learning about her rights, Ajeti and her husband registered their property in both of their names instead of just his. This ensured that Ajeti would not be rejected a loan from a local bank to develop her business. “My business was not always this big, I had some machines and a small number of people engaged. Now, having a parcel carried in my name from my husband’s inheritance will be a boost to my success as a businesswoman,” declares Ajeti. She now has no limitations on getting loans and expanding her business in terms of space, larger equipment and an additional workshop for her staff. “Registering the property on my name gave me strength and empowered me a lot!” she says. Ajeti knew her rights, knew the laws, but her determination to claim her rights ensured by the law was crucial. “I encourage other women, too. Their right on property is guaranteed by the law. No woman should hesitate on her rights,” she says. According to a USAID sponsored property rights survey conducted in 2015, only 16 percent of women in Kosovo own land. Most of the land is registered under the husband or eldest male member of the family. But thanks to women like Ajeti the situation is slowly changing. More and more couples are registering their land in both of their names and more women are claiming inheritance. While Ajeti’s business has grown into something bigger than anyone in the village could have imagined, it wasn’t the only change in Sllatine. Villagers’ attitudes toward gender equity have changed as well now that more women are employed and realizing their property rights. Since 2015, USAID’s Engagement for Equity program has trained 1,540 women and over 500 men on property rights in the municipalities of Viti, Kaçanik, and Strpce, and plans to train an additional 400 men and women before the program ends in 2018.